incredibly fed blog: "Salmon-chanted Evening..."
Misheard lyrics from the southern seas aside this one really is enchanting! It is inspired by the Peruvian and Nikkei fusion cuisine on offer at Pakta, the Adria brothers' latest eatery in Barcelona which we had the pleasure of visiting recently. (See post 6th August 2013) Based loosely on Pakta's ceviche of sea bass and kumquat, its flavours are sophisticatedly subtle like most of the fare on offer there. Very easy to do, it is guaranteed to raise eyebrows and win accolades from every corner of your dining table. 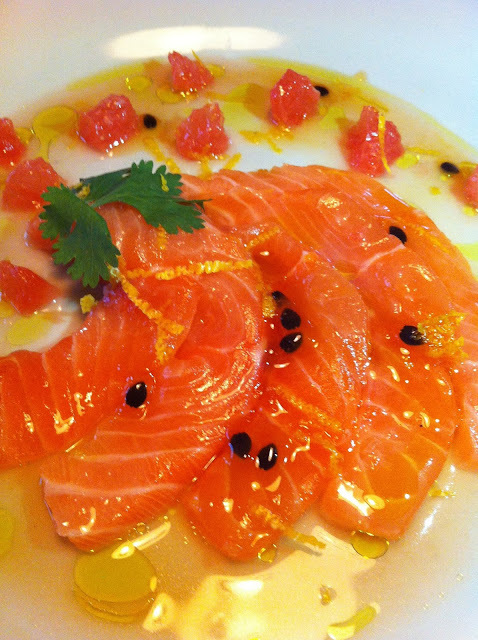 It is a salmon and ruby grapefruit ceviche with maracuya (passion fruit) syrup. The blend of bitter sweet fruit juices together with sashimi will blow your socks off! Syrup - Half and de-seed the passion fruit add the orange juice, lemongrass and sugar. Bring to the boil and simmer until mixture has reduced and is syrupy. Allow to cool. Peel the grapefruit by cutting off the top and bottom and remove the skin by cutting down the sides of the fruit following its curve. Cut between the segments with a very sharp knife to produce slices which have no pith or stringy bits. Set aside squeeze the juice out of the remainder Thinly slice the salmon and arrange on a plate. drizzle olive oil over and spoon over the grapefruit juice and a little of the syrup. Sprinkle a little salt over. Arrange coriander leaves and lemon zest on top. Ice cold Spanish Summer soup!